Natural copper is very ductile and malleable material. But, however, it is highly durable. Added in alloys, this metal improves the resistance to abrasion. Copper has a number of characteristic properties by which it can be distinguished from other metals. Copper has a characteristic reddish-pink color. According to the plasticity of the metal is superior to all others. Copper wire is easy to bend even by hand. It is very important to know how to distinguish copper from bronze. For this it is necessary to strip the copper wire and drop it in hot salt water for 5 minutes. Also most have to do with the intended product from bronze. After exposure to hot brine, the copper will acquire a darker shade. If copper wire is left in open air for a long time, we can observe how it will change. Copper has its own protective properties. Prolonged exposure to atmospheric conditions, it is covered with a protective film of greenish color patina. The film protects the copper from corrosion. Compared to steel, copper has a higher conductivity. In order to see this, it is necessary to heat the copper wire and steel rod. You then need to evaluate the results using the thermal conductivity meter. When heated in the open air, copper changes color. If the copper wire heated over a gas burner in the air, at first it will fade. Then the copper will darken, before acquiring the black color. If drinking water is a lot of copper, the bright water has a distinct metallic taste. It is the excess copper determines such organoleptic properties of H2O. Such water is harmful to health as copper in large quantities is toxic.Skillfully using the properties of copper, you can apply it in different areas. Reddish gold hue due to the addition of copper. In jewelry are often used such alloys to increase the strength of products to deformation and abrasion. Copper - metal inactive. In dry air it does not oxidise or change color. 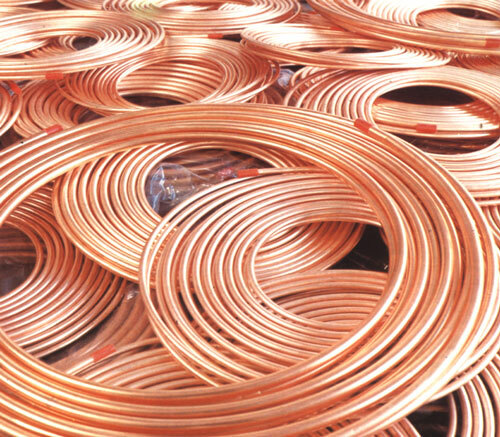 Therefore, to detect copper in such conditions it is necessary on other grounds.